Take care of all your flooring needs at our full-service, well-stocked flooring company. As a flooring store with an impressive national reputation, we offer an extensive assortment of floors, including luxurious hardwood flooring. We carry engineered and solid hardwood flooring from all the top manufacturers and feature a variety of options for selecting the colors and edging of your new hardwood floors. At our flooring company, we truly care about providing the best hardwood flooring installation services and products for your home. It is easy to find and purchase the ideal hardwood floors when you shop at our flooring store. We boast a wide selection of solid and engineered hardwood flooring that is available in many different styles, colors, finishes and grains. In order to make the best choice for your home, it is important to know about the many benefits of hardwood. Hardwood floors are known for having a distinguished and refined appearance. Rooms with these floors exude natural beauty and sophistication. Depending on your interior-design tastes and accent pieces, hardwood can enhance the style of any room. Whether you are renovating a formal master bedroom or designing a friendly living room, an upgrade with hardwood will act as the perfect complement. Engineered hardwood flooring may be for you if you enjoy a more luxurious look, but still want to stay within a set budget. It will leave more money in your wallet at the end of that day and support the green movement by offering eco-friendly options for your home. That is because the wood itself is made from layers of materials, many of which are recyclable. The top layer is made of authentic wood, so the surface of your flooring looks like real hardwood. For scratch resistance and top-notch performance, an engineered hardwood floor is our suggested alternative. It is also a great option because you do not have to worry about it warping due to absorbing water. Engineered hardwood is the preferred wood flooring option for basements, entryways, and other areas that are prone to humidity and moisture. 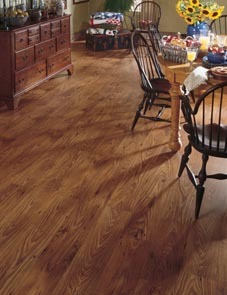 Solid hardwood flooring gives a timeless look to any home. Whether your style is rustic, contemporary, modern, craftsman, traditional, Victorian, bungalow or other, solid hardwood floors are the way to go. This type of hardwood can be sanded or recoated to complement home-improvement projects. However, you do not want to put this flooring in spaces prone to humidity or scuffing. When in doubt, ask our qualified flooring professionals for assistance with the selection and placement of your new floors. Adding hardwood floors to your home gives it character and personality while dramatically increasing its real estate value. Consider our flooring store first if you plan to renovate any of the rooms in your home. Contact us at 217-615-4710 for more information about our selection of hardwood flooring. We proudly serve the communities of Decatur, Forsythe, Mount Zion, Macon, and Solomon, Illinois.